At Crunchfish, we are passionate about human interaction with electronic devices. Our vision is to change the interaction into one on human conditions. We provide software and user experience (UX) expertise for Augmented Reality that creates new interaction possibilities using gesture control and proximity solutions. In some of their latest developments Crunchfish has extended cooperation with LLVision, one of the leading AR-companies in China. LLVision will offer Crunchfish’s software for touchless gesture interaction as default in their new AR-platform. Read more here. In other recent news, a new generation of Crunchfish’s gesture interaction software has been launched. This high-precision one-gesture software solution is specially designed for interaction with any standard AR smart glasses enabling a new intuitive interaction method. It makes it possible for the user to control all functions in the glasses with only one gesture, similar to the touchscreens tap interaction. Read more about it in their press release here and watch the supporting video below. 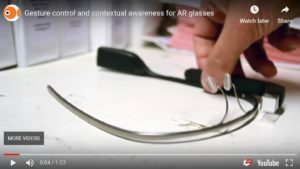 In other exciting news, Crunchfish and RealMax Oy in Finland have very recently signed an agreement allowing the AR smart glasses provider to pre-integrate and demonstrate Crunchfish’s gesture interaction technology in solutions for its RealWear AR products. The partnership further strengthens Crunchfish’s global network of AR-partners and the position as one of the leading suppliers of gesture control for AR smart glasses. Read more about it here. AR devices are primarily designed to be used with intangible interfaces. As such, many existing interaction technologies no longer apply. Touchless interaction is more efficient and accurate in many AR settings. With advanced image recognition and deep learning algorithms, we use the cameras in mobile and wearable devices to detect and track a person’s face and hands. This enables you to engage with digital interfaces in a more natural way using gestures, making interactions more fluid, direct and immersive. Smart contextual awareness is a tool for managing context dependent information that provides the right information, at the right time, in the right place and to the right people. Using low energy Bluetooth, we provide applications with an intelligent proximity layer that creates a mobile network bubble. Within the bubble, this smart contextual awareness lets users of mobile and wearable devices discover what and who is nearby, connect and share information in real time. Sweden. Since 2016, we have been listed on Nasdaq First North. We bring more than seven years’ experience in UX design from touchless gesture interaction projects. Our gesture control software is currently available in millions of devices from global players. Since 2016, we have entered strategic partnerships with providers of hardware or software for AR smart glasses, such as Epson, Llvision, ODG, Goertek, Nibiru and Optinvent. Interaction with smart glasses is in critical need of intuitive UX designs and considerations. To secure optimal interaction, you must consider environmental conditions, information requirements, human factors, ergonomics and other external constraints. A smart glasses user will constantly face situations where existing interaction methods fail, and where touchless gestures serve an important and crucial alternative. This is a key technology to secure information relevance and efficient information exchange. Our proximity software enables smart contextual awareness between entities such as smartphones, wearables, machines, physical areas, and vehicles. 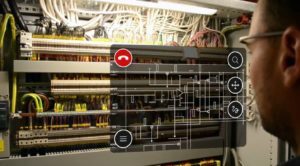 Smart glasses combined with different services will change the work processes in many industries over the next two to five years. Because AR technology enables significant efficiency gains in industry, the growth rate in the AR area is expected to be strong in the long term. Products and services from global players like Google, Apple, Microsoft and Facebook, in combination with development software such as ARKit and ARCore, will drive volume and increase the demand for gesture control software. This is confirmed by the fact that influential industry players agree that gesture control is one of the most effective interaction methods within AR. Crunchfish is building partnerships with global suppliers of AR products and software. Through these partnerships, we are building a strong position in the gesture control for AR market. The chosen strategy to establish partnerships with leading players is central to our ability to take part in market development as volume grows. A higher market understanding of the interaction challenges in different AR environments will increase the demand for user-friendly and efficient ways to interact with AR devices. Technology for smart context awareness will be key to the management of context-dependent information.